No location? The kid is wearing a Cubs hat. If you click here and read the mentions, the reaction was pretty harsh. And the Radical Candor IL account fired off a sharp projectile. How not to handle this: @realDonaldTrump style deflection from the point. Get it together. Not to mention that TIF districts don’t take money from black and brown kids. PI: I’m going to do this in a series of tweets, so please bear with me. First: we have had a series of policy disagreements. That’s expected. But I am extraordinarily disappointed in your organization and your leadership for the way you’re handling this situation. 1st) I disagree with your point, but that is not the issue here. You could have drawn a CPS building, You could have put CPS on the cap. You could have drawn another kid. You could have drawn an african american child without exaggerated features (ie lips), like the white male in the same photo. But you made a different choice, one that links to a dark and troubled history, and when confronted with it, decided to double down. It’s a choice, but not a great one. 2nd) A group whose staff looks like a Trump Org. photo, with minimal front facing diversity, a group who sued to block same day voter registration, with a disproportionate impact on minority voters, a group whose budget book slashed programs with a disparate minority impact, a group who is right now, despite data and evidence, attempting to take $500 million from predominately poor, minority kids around the state, Lacks both the credibility and should, in theory, have too much shame, to be the arbiter of what is fair to black kids in Chicago. You have made your choice. But understand that that choice - especially this week - is incredibly tone deaf and provocative. “At the same time the President of the United States is throwing his arms around neo-Nazis and Klansmen, Governor Rauner’s brain trust at the Illinois Policy Institute weighed in on the SB1 debate by publishing an unambiguously racist cartoon. The critical debate over education funding in this state should be about ensuring a better future for students in every corner of Illinois, regardless of race, income or zip code – and not as an opportunity to divide us further. It’s particularly frustrating because CPS students are making historic academic gains. In fact, three CPS high schools were recently recognized among the top 10 in the country, and seven of the top 10 in the state. Over the past five years, virtually all of Illinois’ academic progress is attributable to Chicago’s students. This is the messaging that so captivated Mrs. Rauner? If you are a Republican or a Conservative, you might just want to take a breath and check before you tweet or post cause this one is pure blindness. Is the racism just so deep in the pores that you can’t see it IPI? even if you don’t recognize the Cubs logo, it’s a C, hmmm. we know what you meant. Can’t wait to hear what Sessions says today about Chicago. seems to be all from one playbook. Hope all those wealthy individuals who support (finance) the IPI reflect on what they have done and start to withdraw their funding. So disgusted with the IPI and hope they get ripped apart by the media. Watch what Rauner does, not what he says. The hat should say Make America Great Again. What? In Chicago, those are hundreds of millions of dollars that would go to CPS. Eh this reaction seems to be a political in nature of trying to make a racial issue where there is not one. Maybe they should have drawn a white kid to make a couple blow hard legislators feel better, I don’t know. I dislike the IPI just as much as the next person, but I get the just of the cartoon. TIF districts in Illinois are abused by politicians and insider businesses. Since 60% or more of property tax dollars go to schools when this abuse happens, it takes money from kids. Yes, you can argue that it does not because the State just makes up the difference in TIF funds, but those are all public dollars that are essentially being diverted in a shell game with the money going to political pet projects. If those shell games are not being played, could more money go toward education? Of course all of this seems disingenuous because it’s the IPI but either way it’s just political non-sense by both the IPI and some Chicago legislators. And replaced by state dollars. The Policy Institute, however, would take those state dollars away. Infatuating use of social media. They’re a real force du jour. Someone at the IPI has a black friend so their cartoon can’t possibly be racist. Right. Publishing a cartoon featuring an obese black kid with thick lips panhandling in the street is NOT racist in the LEAST. Perhaps a cartoon showing their bearded anti-TIF person, as shown in their previous cartoons, taking money away from kids would be more appropriate, then. It’s straight up offensive. That they don’t have the good sense to edit themselves, especially in light of the racists’ resurgence this week, shows total recklessness. These are the people “graduating” to run the Governor’s office and the state. Gross. The only wealthy white folks trying to take money from black and brown kids at this point are Bruce Rauner and John Tillman. Renounce it or accept the racists you see in the mirror. You just know the cartoonist was giggling the whole time he was drawing the child. I would like to hear what a conservative African-American pundit or politician has to say about how cronyism affects inner-city AA children. This comes as no surprise to me. The IPI deserves what it gets for this. One thing that popped into my head reading IPI’s responses… did Lucci run IPI’s twitter? And is he still doing so? Agree with Rep. Mitchell, even if you want to think IPI’s motivation is good (which I don’t) this was just stupid, at the very least, and probably caused by at least unconscious bias/racism. And that’s me trying to be VERY nice. At the very, very least…bad taste. State dollars for the TIF subsidy account for around $200M+ to CPS. By eliminating TIF, CPS is entitled to about $300M+ in annual revenue. Chicago EAV has been growing and that number will grow as well. And that doesn’t even account for the one-time cash infusion that would come from surplusing the money that currently exists in TIF accounts. TIFs take money from black and brown kids. A shell game doesn’t make that any less true. Anon E Moose, is the example you posted racist? Gee, it’s so hard to tell these days…..
Perhaps the IPI and their supporters need the definition of racism explained to them. Has the Gov renounced this deplorable act by IPI?? You can’t just “eliminate” existing TIF agreements. At least not without many lawsuits and millions of millions of dollars spent to defend….that you’ll likely lose. Are you sure? School districts are not allowed to tax businesses that have TIF. Schools are losing money via TIF. When’s the cartoonist get a Deputy Gov job? Rauner & company have joined Trump’s camp. Illinois Policy Institute…Only 1 African-American out of the 29 people listed as either staff or leadership and with a few photos missing. Represents Illinois or just the North Shore? IPI, the farm system for Governor Rauner. Case Example #1,003,471 that largely white conservative groups don’t know how to communicate with African-Americans. We hear a lot about the linguistic disconnect between urban Democrats and rural conservative white voters - and there’s something to that - but this is also a systemic problem. Going to be charitable and see it less as a “Sambo cartoon” and more as a “cartoon by a bunch of clueless Omegas and Neidermeyers” playing out of their league. MrJM more of an acquaintances friends neighbor…. but that still counts right? I will go out on a limb and suggest that the IPI and the cartoonist are not fools, and they have provoked precisely the reaction they sought. That scares me. 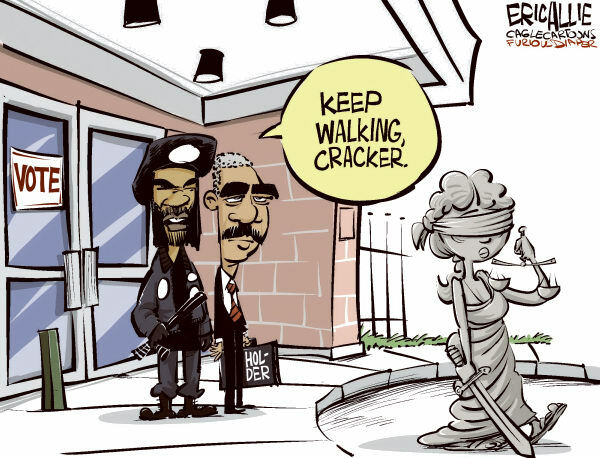 I think this cartoon got ahead of itself by trying to go around the edges of being racially and geographically smart. The problem when you try to ride the edge with a both those triggers to make a point… the line of self-awareness and the line of decency gets crossed without much effort. They know what the message was. They just didn’t realize the subtlety was passed along the way. Would you prefer IPI strive for the abysmal diversity benchmarks of the labor unions instead? City Zen, 5 white union officials out of 23,000 union people? How is that even close to being similar? OW so basically forget dog whistle racism, they were aiming for air raid siren racism? I wonder if this will make Diana’s North Shore cocktail party conversations better. That’s what IPI is for, right? Messaging things to make the First Lady’s cocktail conversations better? What’s a little racism among wealthy friends? The sooner the Rauner’s exit politics and take their money with them, the better. Honest question, how many staff does IPI have if BVR and friends stop writing checks? … they just didn’t realize it. I didn’t read this as racist or insensitive. I would have thought it was making fun of the rich white guy. I respect Rep. Ammons perspective. I see we have devolved to the “whatabouts.” Neat. That’s always a sure sign that you have a defensible argument. The cartoon is so out of bounds it’s hard for me to imagine this is isn’t intentional. Same PlayBook as Trump. Disgusting and cynical. As for TIF, still amazes me that people don’t understand how it works. Ironically, because CTU and others have so successfully demonized TIF Rauner is trying to steal the issue from them and use it to stick it to CPS and it’s teachers. Poetic. Is there a link to IPI’s original post? Or did they delete it? Show me where labor unions post racist cartoons like your pals at the IPI did. RR - Thank you for the lecture. I can only imagine the irony given the lecturer. What time is the selective outrage seminar? Keep ignoring inconvenient truths if it suits your narrative, which can be summarized as such: diversity for three but not for me. No doubt another Diana Rauner branding idea. brown - IPI are not my friends. I don’t condone the cartoon at all. My point goes back to OP who called out the lack of diversity in IPI leadership which is far more diverse than private sector labor unions, particularly with female representation. If you have an example otherwise, I’d be thrilled to concede the argument. Do you? Yeah, they’re just straight up racists. I went in for an interview (no intention of taking the job, just needed interview practice), and the guy led off with a joke about Mexicans. “It’s ok, I am one myself.” Sure, buddy. Whatever you say. I’m not a Chicago legislator, I’m not black or brown but I find this cartoon disgusting. There are many ways the point could have been made without being racist, but I wouldn’t really expect anything better from IPI or apparently from you. Come on, if the point is that TIF is taking money from Kids — shouldn’t the guy be taking the kids money instead of showing an empty pocket and saying I have none for you??? Should have hired Bart Simpson for the cartoon gig. Bart has a nice ambivalently yellow complexion. The lip thing I can see, but I don’t see the kid as obese. He has a big head, but most of the body is covered by the sign and the backpack. And the bigger head on the kid is commonly used in cartoons to emphasize age (as big head and smaller bodies are associated with youth in general). To the substance of the cartoon, if the IPI drew a white kid as well, would that really make a difference? The point of the cartoon is to emphasize that there is funding in Chicago for schools while the city cries poor. That isn’t a new thing. Ask Karen Lewis about it. Intent really does matter. Go and watch the video for Jay Z’s The Story of OJ. It’s a cartoon based on the old Sambo style cartoon to emphasize certain features. Compare it to the IPI cartoon. When Jay Z uses it, he’s doing to show how the community can rise above what sad stereotypes may have been forced upon them. Ask yourself if the idea of an old white guy pocketing TIF funds for “economic development” at the expense of poor kids in Chicago isn’t real. It is. Look at the TIF funds for Navy Pier. That money could have gone to schools. Lastly, look at the people who went to the United the right rally in VA. Look at the awful things they say and share and ask yourself is this cartoon from the IPI falls into the same category. It doesn’t. It is amazing to see so many jump at the IPI and Rauner for being racist when there are real racist who clearly are full of hate. It’s racist that the media coverage focused on white nationalists in VA when people continued to be gunned down in Chicago. This cartoon isn’t racist. The people who helped perpetuate segregation in Chicago are racist. I wonder how all of those AA clergymen feel about Rauner and his IPI ally now? Really. Not linking the two in the same story is your definition of racist. I hope your MAGA hat is the red one so it matches your confederate flag shirt. The IPI live in an ivory tower in their collar county suburban McMansion completely disconnected from Illinois not realizing that their are kids that are important outside of their little ultra wealthy school districts. If their(IPI’s home disctricts) pool chlorine budget was cut by 10% so a deep southern Illinois district could get textbooks they would be howling like a bunch of angry chimps. Not what I meant. I think the plight of people who are affected by gun violence in Chicago deserves more attention than nazis. Why should anyone care about them? They are garbage. There are innocent people suffering in our own backyard. Rich, you can fact-check me on this one. But I thought that, with TIFs, the schools lose the increment and the other property owners make up the difference; i.e.,because of PTELL, any rapid growth in property values in the TIF district wouldn’t have much impact on the levy. Think what this will do to “Diana’s Brand” too. Maybe that will make IPI take it down. Correct, TIF does not take money from CPS. It is an extra tax. Oswego Willy - That was my first thought too. Is that one of Diane Rauner’s preschool kids expecting his early childhood education to be properly funded or is one of those pesky k-12 Chicago kids expecting their schools to be fairly funded? At the basic level a kid asking for his school to be funded drawn as a beggar is just unbelievable. The vast majority of those being killed are not innocent. You literally took my breath away. May G-d forgive you. Because they’re the President’s base that he played to his entire campaign. Soccermom, give Tone a little while - he’ll top it. That’s not even the most offensive thing he’s said this summer. Ron, do you have anything other than your sunny disposition to back up your claim? Like facts and such? Drug dealer and gang bangers are not innocent. Ron, they may not all be innocent, but you are truly ignorant. I have little sympathy for gang bangers killing each other. You may not like that but it is not ignorant. One thing we should do is legalized and regulate drugs destroying the illegal drug trade. Enron, just go away back to Trumpland. Glengarry, I voted for Clinton. I can’t stand Trump. Be t I see you can’t refuse what I’m saying.